congratulations, you have arrived at the 2016 PMBO General Discussion Thread, This thread it totally open for build off discussions, help needed, and anything between. Are we also posting our details of our build in this thread Russ? Here is what I'm building. This is not an entry. Glad to be participating again and I am looking forward to this years fun. I don't know Russ, your little paper drawing sure doesn't look like the self-powered 3D printer gizmo I was expecting. This is the first time im participating in the PMBO! watched all you guys on the internet for quite some while and still enjoying all your videos! I learned alot in the last couple of years from viewing your video's and that's why i really want to participate. You guys shared your stuff, and now is the time to share what i found out. This is a great opportunity for me to start doing that! For my build i will be combining a couple of different aproaches in the alternative energy to 1 build wich ends up being a pulse motor system. Shuffling energy back and forth between 2 battery banks. And maybe more (ill see what i can think off). For the next couple of days i will be collecting the parts i think i will be using on this build off. When i got everything i need (wich should be end of this week). I will be posting my intro video to show you guys what im gonna use for the build. Here are the first parts i collected for building so far. - A rotor made of salvaged Harddrive and a vacuum motor dust cover. I'm really excited to get this show on the road! And i wish all builders the best of luck at there build! so glad you are joining! that's what this is all about! ps. do you have a you tube? yeah i do have a youtube acc. There is not much going on there though. As i am getting to a point where i have something to talk about instead of just replicating work. Most of the video's i've made are on facebook. Got to find some time to upload a bunch of them to youtube. fantastic Acid Byte! looking forward to it! my question is, would "detonation" - defined as high-enough temperatures to result in hydrocarbons (or just plain hydrogen) burning the *hydrogen* component where you then get a flame speed of 1,000 metres per second - count as.. err... "pulse"? very very few engines in the world are actually built around "detonation". some of those that are end up hot enough to cause breakdown of nitrogen (resulting in huge emissions of NOx). *careful* design - sitting somewhere in the middle - results in an incredibly efficient engine that can burn petrol, diesel, methanol, methane, ethanol, stove oil, kerosine, engine oil, hydraulic oil, and of course pure hydrogen (if the piston and cylinder liner is ceramic). this design is a very... comprehensive shall we say... critically-interdependent combination of mechanics, physics, material science and chemistry, which even the self-appointed wikipedia "experts" on the Bourke Engine's "Engineering Review" section publicly demonstrated and announced their complete and total inability to the world to comprehend. however the end-result engine, which is a combination of patents dating back to the late 1800s, 1906 and the 1930s, is mechanically extremely simple and could (with a template to copy in one instance) be made entirely on a lathe. i'm planning to 3D print the parts, designing them in such a way that they can be laser-cut as steel laminates, and bolted together. i will then replace each part one at a time with metal until i have an engine that can be safely fired up without melting. would this qualify, if so i'll do something random with a video camera. Little Intro movie to my pulse motor. i think we are all clear! go for it! 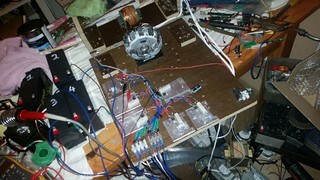 I'm going to try and finish my pulse driven wimshurts machine for the competition. It's a fail project that got shelved a long long time ago. I've got some experiments I'd like to carry out with the wimshurst if I can get it running well. Here is the easier part of my build, the base/generator section. Few little fine tuning parts too do and it should be done. That's one crasy idea Deeds! im liking it! May the best of luck be with you! mine is coming along, i spend 3 nights playing with magnets... smashing glass... and drinking coffie! its going to be a challenge!